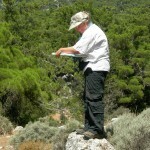 There are several explanations about the beginnings of Kefalonia. Stone Age tools have been uncovered in caves around the island, so we know that people have been living here for a long time. However, legends sometimes present different pictures of how things happened. What an archaeologist does is measure each picture (or hypothesis) against physical evidence that can be found – not unlike a detective trying to solve a mystery. One story says the island derives its name from Kefalos, an Athenian who founded four cities named after his children – Sami, Pali, Krani and Pronnoi. Others say the island is named for an ancient people known as Kefallines, who lived here when Athens was little more than a village. In fact, the first mention of these “Kefallines” is found in Homer’s Iliad, in reference to the people ruled by King Odysseus (called “Ulysses” in Latin) on several Ionian islands. At that time (around 1200 BCE) Kefalonia was part of the kingdom of Odysseus, the wily king who devised the wooden horse that ended the Trojan War. Some evidence suggests Kefalonia was actually Homer’s Ithaki and the Mycenaean ruins excavated here were once home to Odysseus and Penelope. Kefalonia and Ithaki have not always been known by their current names, so legends can be misleading. Whether fact or legend, as we sip our morning coffee on the quay and look across the channel to the dry and rocky island of Ithaki, it is easier to imagine Kefalonia as the center of a kingdom. After breakfast, we rent a small car so that we can begin to explore this island kingdom. The woman at the car rental office says we should always honk the horn when we come to a curve. When we ask why she explains all the roads on the island are like – and she draws twisting lines in the air.Our first destination is Argostoli, the main port and capital of Kefalonia. It is on the other side of the island, and so we must drive through the mountains to get there. Soon after leaving Sami we realize the truth of the car lady’s warning. Climbing into the hills it seems that every curve turns back upon itself in a never-ending series of switchbacks. With sharp embankments on one side of the narrow road and steep drop-offs on the other side, it is prudent to toot the horn several times at each curve to warn drivers coming from the opposite direction. We travel our winding road through the Ainos mountain range, which extends through the southern part of the island. Its highest peak, at 1628 meters, is called Megas Soros (Great Mound) and is the site of an ancient sanctuary to Zeus, king of the Olympian gods. It is interesting that high places are often chosen for religious activities. On the western side of the Ainos range is the old monastery of Sision, which was founded in 1218 by Francis of Assisi himself, who briefly visited the island during the Fifth Crusade. It was destroyed – along with almost every other structure on the island – during the terrible 1953 earthquake, but it was rebuilt and is still operating. The most amazing thing about these mountains is the dense vegetation. Every hillside is covered with forests of fir, pine, arbutus and oak, and the deep valleys are filled with olive groves and citrus orchards. The entire range is a natural preserve that provides a home for many species of animals, including beautiful wild ponies that live only in the highlands. 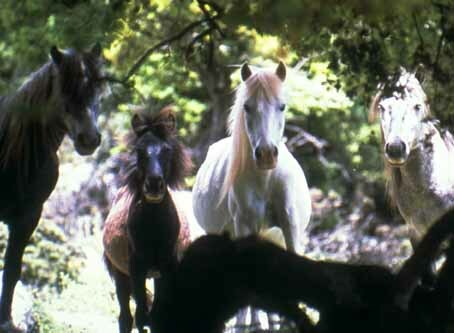 The wild Ainos ponies, which some believe are a unique breed, owe their existence to the villagers’ old custom of keeping herds of horses free on the mountain in order to avoid the cost of feeding them. They were abandoned in the wild during and after World War II. Descending from the mountains, the western coast seems to spread out beneath us. We can see a long, narrow gulf with the towns of Argostoli on one side and Lixouri on the other. As we approach the lowlands the road splits. A road sign indicates both ways take us to Argostoli, but one direction is for buses and trucks. We take the car route and continue down until we reach a slender stone bridge that crosses the harbor to Argostoli on the far side. This is the bridge of Drapanos, built during the time of British rule (1813), and there is no way a bus or truck could pass over it. Even with our subcompact car we pass within teeth-grinding inches of cars coming from the other side. As we enter Argostoli, we can see it looks very much like Sami, but more cosmopolitan and much larger (actually about ten times bigger). The buildings are all very colorful (in the Venetian style) and have red tile roofs. Like those in Sami and the rest of the island, the buildings appear to be quite new – even those built in older architectural styles. This is because of the great 1953 earthquake, which I mentioned earlier. Before the quake there were around 360 villages on the island; today not nearly so many, and very little pre-earthquake architecture can be seen anywhere. To find out more about the town, we go to the Historical and Folk Museum located on the ground floor of the library. 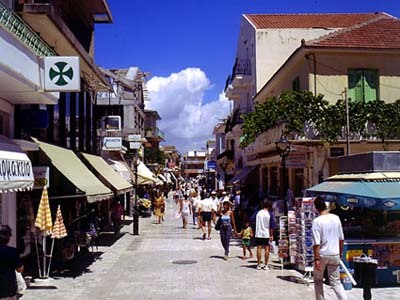 It provides a peek into the 19th century life of Kefalonia, but this is only a small segment of history – the period after the decline of the Venetian empire, when the French and English ruled the island. Only a few foreign governors did anything to help the people of Kefalonia, and these few are memorialized in the museum. What the foreign powers wanted most was the strategic location of the island – relative to Greece and the Ottoman Empire – and the tall straight trees of the Kefalonian highlands, which were used to build warships. 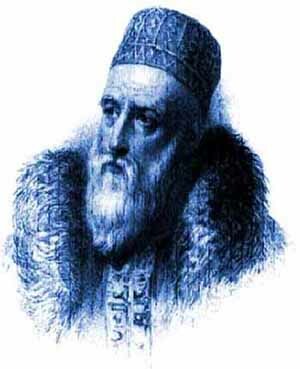 Sir Charles Napier, was one British governor who gained favor with the locals. He loved the island, supported many development projects to improve the lives of the people, and even supported the Greek revolution against the Ottoman Empire, despite Britain’s official opposition. One of the most famous supporters of the Greek War of Independence, Lord Byron, lived not far from Argostoli in the early 1820’s – just before he joined the patriots fighting for freedom. When the Greeks won their struggle for independence, and after the “great powers” of Europe carved up Turkish holdings, Kefalonia and the other Ionian islands joined the mainland as part of the newly formed kingdom of Greece. But their troubles with foreign invaders were not over yet. The island, and most of Greece, was occupied during World War II by both the Italians and the Nazis, and the islanders suffered greatly at the hands of the latter. The historical museum showed us only a small part of the island’s history, and we want more. 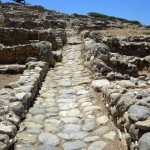 We walk a short distance to the town’s small archaeological museum. It provides some interesting artifacts from prehistoric times, when the inhabitants of Kefalonia used stone tools. There are also many examples of the Roman occupation, when the island was used as a harbor from which to launch the conquest of Greece. 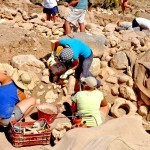 However, there are surprisingly few examples of ancient Kefalonian culture during the Mycenaean and Classical periods. We know that such artifacts exist, because there are photographs of major archaeological digs and tantalizing accounts of the discoveries. We suspect that most of the “good stuff” was shipped off to the national museum or to other countries. We know that archaeological work is still being done on the island, and we are determined to find out more. However, that will have to wait. After leaving the museum, we explore more of Argostoli town. It is a bustling place with a lot of tourists, many of them arriving from Italy on large ferries. However, it is a bit too commercial for our taste, and we begin to miss the little village of Sami. After pausing for a cool frappe at Plateia Valliano (the main square), we climb into our car and leave. Rather than using the nerve-wracking old bridge across the harbor, we take a different route out of town. This leads us past the site of the Mycenaean citadel Krani and southward towards a mountain pass different from the one we used earlier. As we drive through the little village of Travliata, we see a sign for Kastro Ayios Giorgiou (Castle of Saint George). When we look up, we can see a gigantic citadel sprawling over the summit of a great hill. It looks too good to miss, and so we follow the signs and find ourselves climbing a narrow ribbon of pavement that, surprisingly, terminates at a small community of pretty houses clustered around the main entrance of the castle. The castle was originally built by the Byzantines to control this part of the island and to keep watch for pirates or foreign invaders who might land here. Under the Venetians, the castle grew and grew from the 12th through the 15th century. Unfortunately for the Kefalonians, in the late 15th century the island fell to invading Ottoman Turks, led by the blood-thirsty Ahmed Pasha. 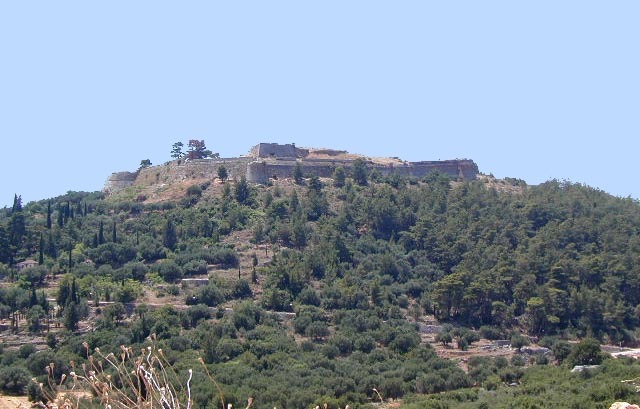 The Turkish soldiers garrisoned at Ayios Georgios castle were notoriously cruel to the local population, who fled the low lands almost immediately, leaving their homes and crops untended. Historians record that Pasha “chopped up all the nobility” and transported many of the peasants to Constantinople. Control of the island changed hands several times over the next several years – Turks, Venetians, and then the Turks again. 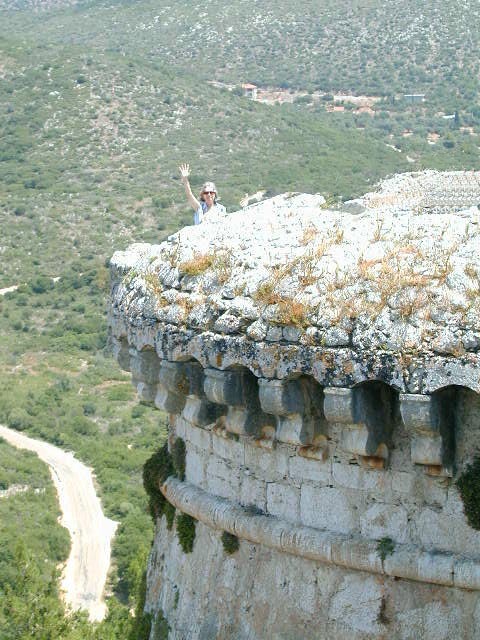 Then in 1500, after a three-month siege of the castle, the Venetians regained control, established their rule on the island and fortified the castle, which became the administrative center for the governors of Kefalonia. 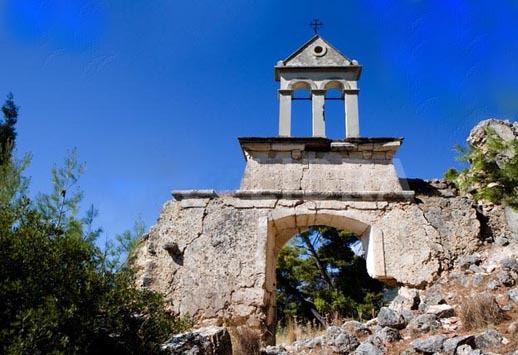 It remained the island’s political center until a huge earthquake severely damaged the fortress in 1757, and the capital was moved to Argostoli. Over nearly 500 years Venetian culture has been deeply embedded here. From Venice came fashions, art, music, letters, its education and health systems, its laws and architecture and even the tomato! Venetians planted many of the olive trees that can still be found on the island (olive trees can live hundreds of years). 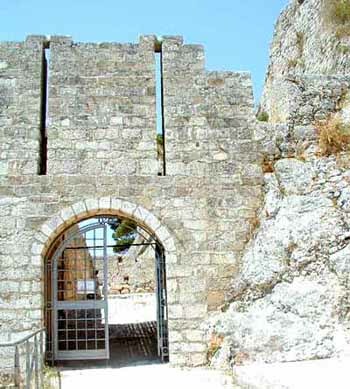 We park the car and hike up the castle entrance, which has two gates – an outer gate protected by a high wall and battlement that could be manned with an armed garrison, and then a passage through the wall to an inner gate that could be used to trap any invaders who managed to get past the first gate. It is difficult to imagine what would be necessary to defeat a behemoth fortress like this one. As we walk along the battlements and turrets, we can see places where the walls have been breeched by cannon balls. There are old bronze cannons still lying near the walls they protected during the last great battle, and we explore some buildings that were never destroyed – still standing after six centuries. Lord Byron once stood here in the 19th century and imagined escaping the embattled fortress through the secret, underground tunnel that once connected Ayios Georgios to the town of Argostoli. The tunnel was destroyed long ago. The fortress is encloses hundreds of acres of land and supported many thousands of armed men and town folk who lived in the suburb (borgo) outside the entrance. Most of the borgo is gone now, but there are Byzantine churches and other buildings among the newer homes that were built in that area. The metropolis church in the borgo is a good example of “Ionian baroque” architecture, which occurs nowhere except on these islands. Some important post-Byzantine icons from the ruined churches of the castle are stored here. After a fair amount of exploration, we decide it would be wise to continue our journey through the mountain pass before it gets too late. We do not want to be driving on that road after nightfall.